Ever have one of those moments where something your child says brings you up short and you realize that there's something important that somehow you neglected to teach? A friend of mine once realized that somehow her 7 y.o. had never learned (or more likely, had forgotten) what to call his heel. Isn't that embarrassing! My daughter asked me a question yesterday about immigration that made it glaringly obvious I'd neglected to expose her to some information every citizen ought to have. Sometimes one of my children will mention a wonderful, classic children's book, and one of her siblings will say, "Oh, I should read that sometime." And I will raise my eyebrows and calmly say, "What? You haven't read that? How did I miss that? Why haven't you read that? I have failed, failed, failed as a mother, educator, and human-being if you haven't read that book! How could that have slipped? Where did I go wrong?" Not too long ago one of the children old enough identified a picture of some kid in a basketball uniform as a football player. We're not really into sports around here, but that one caught even their utterly sports illiterate (and proud of it) mother up short. Whenever something like this happens (and on many other occasions - we don't need much provocation to bring out our insecurities), we all begin to worry and wonder, "What else isn't being covered?" And my guess is, plenty. But my guess is that's true of all forms of education, public, private, and home. I spent the first three years of public school in another country - and when our family returned to the U.S.A., I embarrassed my mother by pointing to the Stars and Stripes and asking, "What's that funny flag with the stripes?" The mother of the young person who didn't remember what to call his heel graduated in the top echelons of her upscale school's class, but when she was all grown up, it was me who taught her how to use a library. 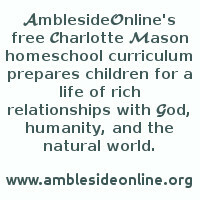 Many homeschoolers begin homeschooling out of reaction to something the public schools did or did not do. Reaction is good, it's part of responsible parenting, but reaction will not sustain us for the long term commitment. The fact that the public school did not teach your child to add properly will not long be enough to motivate your homeschooling - especially when you note some area that you have missed as well. So Public Schools, do, in my experience, leave far too much uncovered, but that doesn't mean that a homeschool will be able to do it all, either. Trying to do it all is a sure way to burn out, for either public school or homeschool teachers. So we do what we can. We teach, we learn, we study together. Christian parents pray and attempt to discern what God's purpose for this child (and He has one for every single life on earth) is so that we can support it rather than hinder it. We learn to homeschool proactively rather than reactively - what the public school does or does not do no longer has any bearing on why we homeschool or even how we homeschool. After all, the local hospital cafeteria has no bearing on what or how we cook our family meals, because the two institutions of hospital cafeteria and family mealtime have little in common in regard to goals, mission, or circumstances. So we make our homes centers of learning and we help our children learn and grow, and we understand that nobody can do everything. There will always be gaps no matter how one was educated. Most importantly in our home, we keep alive a thirst for learning more so that our children ever will be learning, ever will be growing, ever will be alive, not merely existing. This is not the same thing as the tired old mantra about how schools need to teach kids 'how' to learn instead of teaching them so many facts. Charlotte Mason said this more elegantly, but a rough paraphrase of her thought would be that it's kind of silly to talk a lot about teaching how to learn without ever giving the kidlets anything worthy to learn- sort of like mucking about teaching how to eat without ever actually giving them any food. That's not to say that learning how to use educational tools to discover information isn't important. It is, just as it's important to learn how to use a fork and knife. However, if a child gets hours of practice in the proper use of utensils, without actually being given any food to work with, he will die. A child educated in the process of discovering information (how to use a websearch, an encyclopedia, the library), but never given any worthwhile, nutritious ideas to feed upon will die intellectually, or at least badly stunt his growth. A child taught to properly identify a list of foods, eating utensils, and place settings has learned something worth knowing- but unless he actually takes in some food, that knowledge will do him little long-term good. A child taught lists of facts all through school is in a similar condition- he knows many facts, but he understands little about the connections between those facts and he has but a distant acquaintance with ideas. Most important is keeping alive the desire and taste for discovering new information. As Charlotte Mason says, it's not just how much he knows, but how much he cares about what he knows. So relax. There just isn't enough time to cover it all, to teach all the facts you will ever want your child to know. We are all sometimes chagrined when we come across something we have failed to teach our children, but if we introduce them to a wide and generous curriculum based on ideas, we will more often be delighted when they teach us something we never learned. The more they read good books, the more ideas they meet, and the more ideas they meet, the more connections they are able to make, and the more connections they make, the more they are able to fill in their own gaps - and ours. For another look at gaps, read this letter that an unschooler wrote to her relatives who were concerned about her lack of a regimented curriculum for her son.